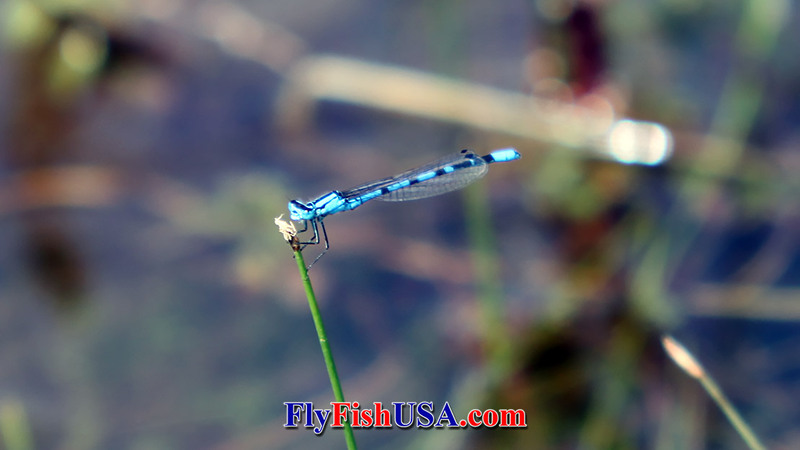 Damselfly Dry Flies Flies for fishing in lakes. Damselflies are those delicate, iridescent cousins of the dragon flies that you see around lakes and slower streams during the summer months; usually June, July and August. They are highly predacious during both their nymph and adult life. They eat other smaller aquatic insects. As such, they are near the top of the food chain and are very dependent on healthy populations of mayflies and midges. In alpine lakes, damselflies may be of such sparse populations as to draw little attention from trout. In shallow alkaline lakes with ample weed beds, damselflies can reach such unbelievable populations that the entire margin of the shore line is painted bright blue for miles. In these lakes, damselflies in all stages are aggressively fed upon by all the fish that live there. 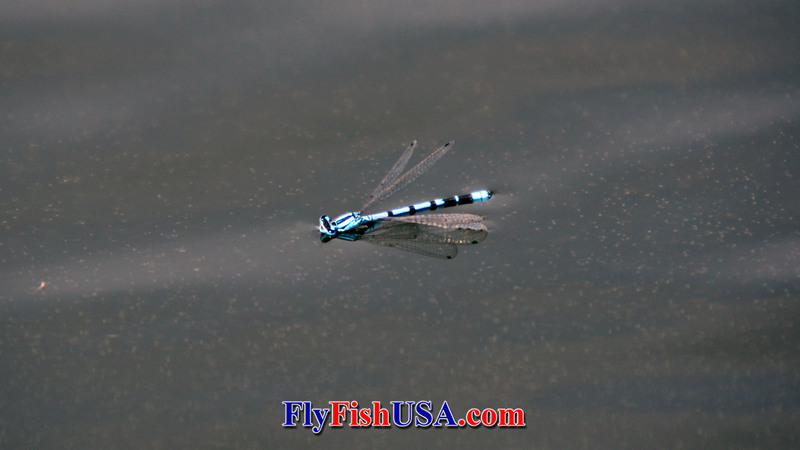 The most common damselfly specie in Oregon wears adult colors of bright iridescent blue that is outlined in black. The eyes are prominent in the silhouette. The body is long and thin and the blue parts are semi-translucent. When the insect lies spent upon the water, the long delicate wings are nearly clear. Often they are lying with others of their kind, on glassy slick water which gives the trout the perfect opportunity for complete inspection and comparison. Your fly has to be an exact counterfeit to fool them. Damselfly nymphs hatch by crawling above the surface of the water. When blue damsels first emerge from the nymphal shuck, they are light olive or even yellowish in color, and turn to their adult colors as the skin dries and hardens. In certain rich desert lakes, damsels hatch in masses and some rocks, sticks or dead trees become encrusted with damsel shucks with hundreds or even thousands of damsels emerging on one structure. Some of these olive hatchlings fall into the water where they are doomed. Trout often congregate around structures where damsels are emerging. They acquire a taste for olive damsels very quickly. After damsels mate, the female crawls down a plant stalk and lays her eggs under water. This is accomplished by her drilling a hole in the stalk with a specially designed auger on her tail end. Then she deposits her eggs inside the plant. This is an exhausting process while holding your breath. When the female crawls back up the plant stalk and reaches the surface, the male damsel flies down and picks her from the surface of the water and deposits her where she can dry and regain her strength. 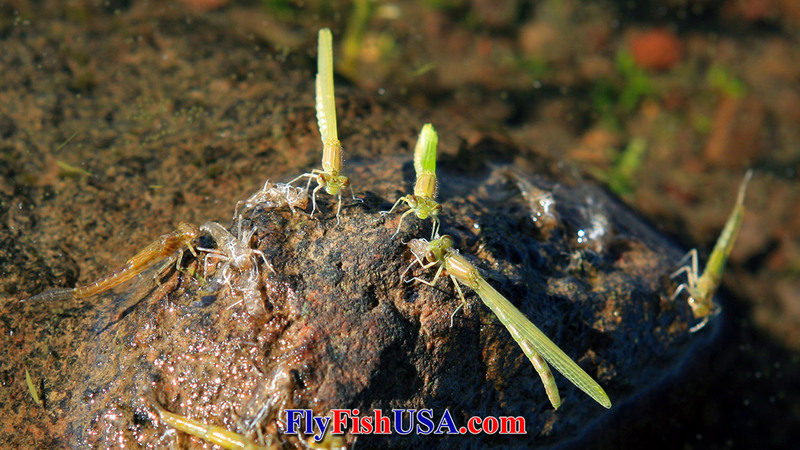 During this whole process, these insects are extremely vulnerable to cruising trout or bass. Sometimes the male damsel hovers above the surface of the water holding the female as she deposits her eggs. These flies are often stalked by feeding fish. You will notice in the photo above that female damsels are more dull in color than their male counterparts. More information about damselflies here.